Since the Age of exploration and discovery, western civilizations have extended their political and economical influence to the rest of the less-developed world through colonization. The technologic progresses during the industrial revolution further accelerated the speed of colonization and facilitated the implantation of western power in the colonies. With no doubt, the western dominance in the colonies’ politics and economy also encroached the culture and art of indigenous people. A great many natives under colonization gave up their traditional ways of living and crafts-making and embraced the western counterparts. In the contemporary society where diversity and multiculture are advocated, decolonization in political field is on the way. Many countries in Africa and Asia became independent during the mid twentieth century. 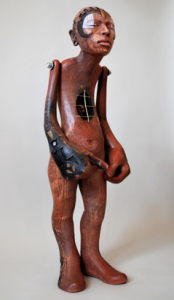 However, the decolonization of indigenous art encounters with loads of challenges, because the cultural stereotypes deeply imprinted prevent people from respecting and appreciating them. 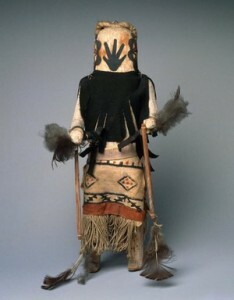 The native American art is just the case, as shown more evidently in the Brooklyn museum. Their works of art are rarely exhibited. Among the total twenty long-term exhibitions in the Brooklyn museum, only two are relavant to native Americans, which are Life, Death, and Transformation in the Americas and Small Wonders from the American Collections. Even there are only two, their works of art are not in independent sections. Life, Death, and Transformation in the Americas focus more on Maya and Aztec, with a smaller portion on native Americans, while Small Wonders from the American Collections focus more on European settlers. The mixed display of native American arts with other art forms admittedly helps the visitors to compare for the stylistic and symbolic similarities and differences, but it also invariably lessens their attention to native American arts. The location is another challenge. The two exhibitions are located in the fifth floor, while in the four floors below there are African, Asian, Egyptian, European and modern arts. Usually visitors start from the first floor, so the exhibitions there are commonly the most popular. Similarly, the fewest visitors will go to fifth floor. Even they do, they are likely very tired and will only skim the exhibits instead of looking closely. Last but not least, the contemporary arts of native Americans are missing. There is not even one piece of them in the Contemporary Art Galleries and in American Identities: A New Look, Modern Life. The indigenous arts did not disappear in modern world. On the contrary, they are thriving in rich forms, such as ceramics, paintings, sculptures and hides. Also, the contemporary native American arts are indispensable, because only with them can we find out the continuity on forms and styles through history. There is no reason to be excluded. There could be a solution to the challenges in museum. Like Paul Chaat Smith, to be a curator or to establish a museum as a native American may help spread and preserve native American arts. But still it is a long way. What’s the first thing that comes to mind when you think of Native American art? If you’re anything like the majority of non-Native Americans, a vague jumble of pottery, baskets, and blankets probably sums up all you know about Native art. But what about prints, photographs, paintings, and all the other forms contemporary art can take? Native artists have been creating incredible, inventive contemporary art for decades, but most Americans have no clue. Here’s a piece of contemporary art you’ve probably never seen before: “Animals out of Darkness,” a 1961 print made by Inuit artist Kenojuak Ashevak and displayed in “Decolonizing the Exhibition,” a show of modern Inuit art hosted by the Frances Lehman Loeb Gallery at Vassar College. The reasons for this knowledge gap, said the artists, collectors, and curators on the panel Decolonizing the Exhibition: Four Perspectives on Indigenous Visual Culture in the Museum Space, are numerous. 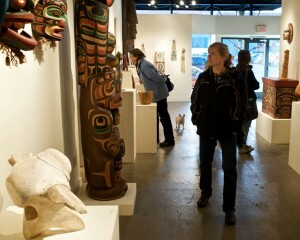 First off, very few museums exhibit contemporary Native art. Some own contemporary pieces but never let them out of storage, while others display only decades-old examples of “traditional crafts” that are often viewed from an ethnographic perspective—that is, not as works of art, but rather artifacts that provide information about the life ways of Native peoples. 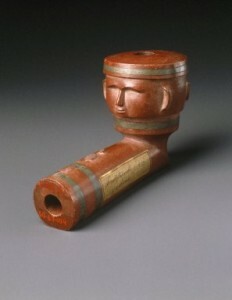 For example, a look through the Metropolitan Museum of Art’s website revealed a single gallery containing the “art of Native North America,” part of a larger collection entitled “Arts of Africa, Oceania, and the Americas.” The most recent pieces in that gallery are “1970s-era tobacco bags.” By contrast, the American Wing has 73 galleries, while the Modern and Contemporary Art collection hosts over 12,000 works by a wide range of international artists dating from 1900 to the present. Although it would have been impossible to look through the combined 29,000 pieces in these two collections, the fact that the gallery of Native art is separate from both the American and the modern collections suggests that few to none of the works in the two latter collections are by Native artists. The gallery of Native North American “artifacts” at the Metropolitan Museum of Art. In addition to this museum conundrum, the panelists pointed out that Native Art is rarely studied or discussed in academia. Sarah Sense, a Native artist with bachelor’s and master’s degrees in art, said that she had never taken a course in Native art and had rarely seen any examples of it during her time in art school. Similarly, Pilar Jefferson, an art history major at Vassar, said that she had never discussed Native art in the classroom. This erasure of contemporary Native artists has a range of negative consequences. 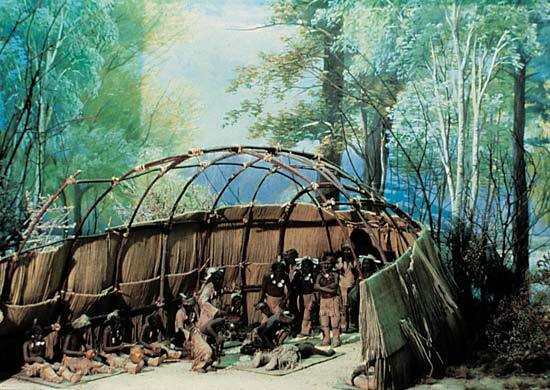 By only exhibiting works that are generally over a century old, museums reinforce the Eurocentric narrative that Native Americans all died off or simply vanished after the arrival of European settlers. 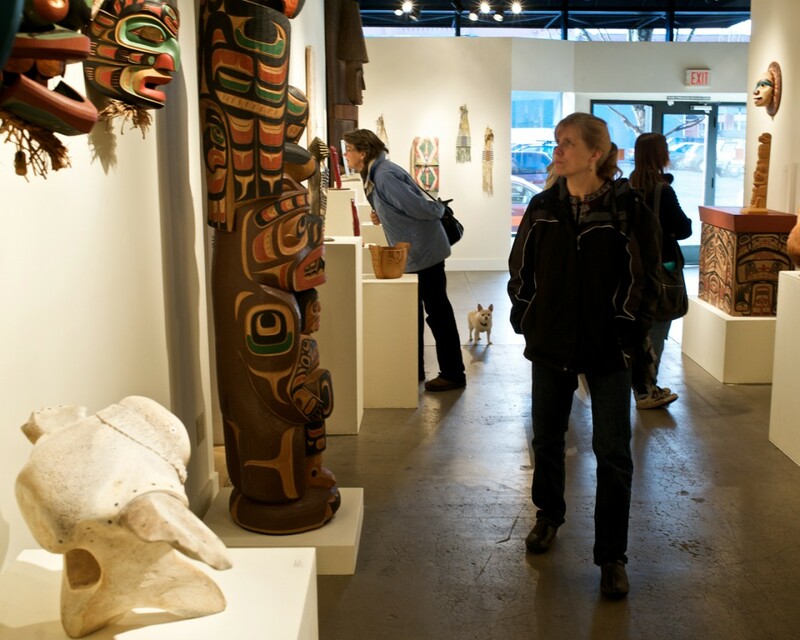 And by displaying Native art as ethnographic artifacts or traditional handicrafts, museums negate Native artists’ creativity and ability to respond to the modern world. 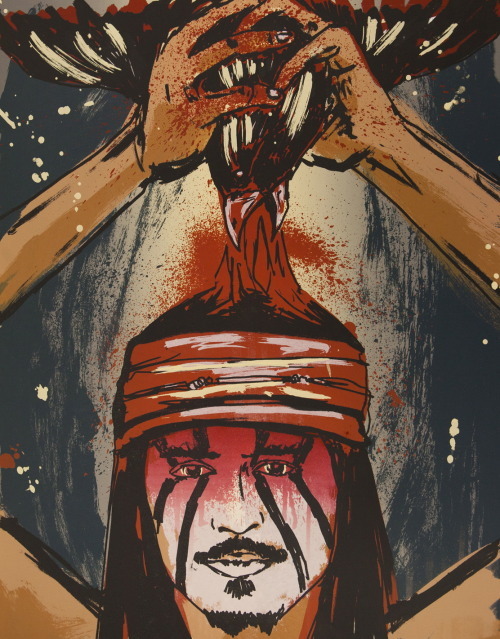 “Red Raven, Red Raven,” a screen print made by Tom Greyeyes, a contemporary Navajo artist, in response to Johnny Depp’s portrayal of Tonto in the recent film adaptation of “The Lone Ranger.” This is one of many examples of Native artists critiquing the portrayal of Native Americans in popular media. 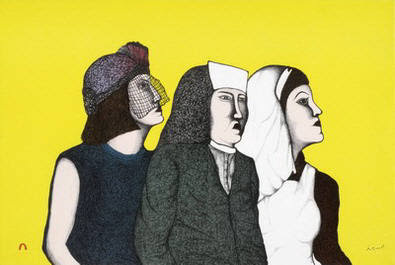 From both the panel and the exhibition of contemporary Inuit art in the Loeb Gallery, it quickly became clear that contemporary Native art is not only real but thriving, addressing everything from the incorporation of modern technology into traditional life ways to the portrayal of Native Americans in the media. Contemporary Native American pieces are not crafts or artifacts; they’re works of art. Vassar College’s Art History program has been known for its progressive contemporary art programs, but for this experiment interdisciplinary efforts were called for. In fact, the Art department was not the one to call for this experiment – the Native American Studies department did the majority of the preparatory work under Professor McGlennen. It took two years, but the class, Decolonizing the Exhibition, was a huge success; pulling from the Art History department many of its students. In its novelty the exhibition held a panel for students inside and outside the class to hear from the forces that put the exhibition together. One panelist was McGlennen herself; another, Edward Guarino, a collector of Indigenous art and friend of Vassar; third, a student: Pilar Jefferson; and lastly, Sarah Sense, a Native American artist. All four panelists explained the goals of the course as related to the art/museum world, as well as the education world. The panelists expressed their concerns that they had never learned about the contemporary Native American art movement in their Art History educations and when they came into contact with Indigenous art in the museum it tended to focus on older generations in an anthropological manner. 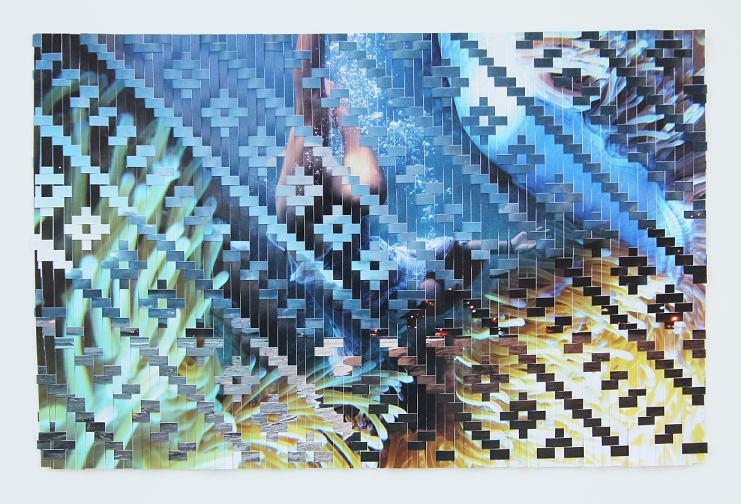 The way this exhibition was executed – through the Native American Studies department instead of the Art department – allowed for a new approach to contemporary Indigenous art installation. Jefferson and McGlennen both explained the limitations and challenges of such an exhibition, especially in a museum, where traditionally Indigenous art is displayed in an anthropological manner, stopping right around the 20th century – as if Indigenous art died out, as if Indigenous people died out. This tradition of displaying only older generations of Indigenous art and artifacts in art museums reinforces the colonialist view that Indigenous people died out when the Europeans came. McGlennen and her students stressed this problem in their working on the exhibition, in hopes that they could destroy this traditional view of Indigenous art. They picked contemporary art because it was so rare in the art museum and it exemplifies the struggles that Indigenous people encounter, sometimes the same problems as older generations, often compounded with new problems. They also expressed interest in being as true to the artists in their wall labels as possible because none of the students were Indigenous themselves. They began each label with a quote from an Indigenous person, always conscious of their job as allies. The most important theme in this exhibition was the idea of “the story.” It seemed to all four panelists that Indigenous art sought to tell, express, or continue a story. Sense and McGlennen, both Native American, agreed with this idea; Sense many times told a story herself in hopes to explain her art to the students. McGlennen stressed, though, that the exhibition’s purpose was not to simply display the art in a non-anthropological way, but to help display the art without adding America into the story. Even if America affected the story, the story was never about America.